Have you considered growing edibles in containers? That means vegetables, herbs and fruits . . .even edible flowers. You could step out your back door and bring in fresh berries for your cereal in the morning . . . or soft lettuces for your salad for lunch. Gather rose petals or hibiscus flowers for a beautiful garnish for a special evening meal. Would you like to grow some of your own fresh produce to offset the grocery bill? Growing edibles in containers allows you to do this, no matter where you live. When looking for varieties of edibles that are best suited for containers, look for key words in their description – dwarf, pixie, patio or compact. They have been specifically bred for gardening in small spaces. Almost any food that you grow in the ground can be successfully grown in a container – vegetables, fruits, and herbs. 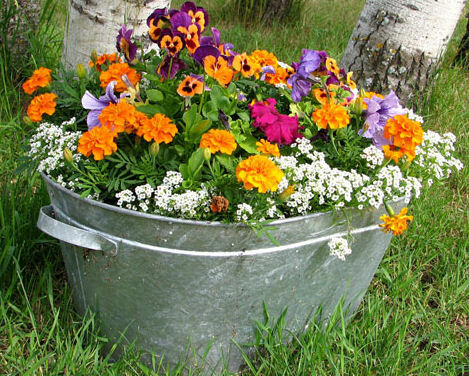 Many of the flowers that grow well in containers are also edible too. 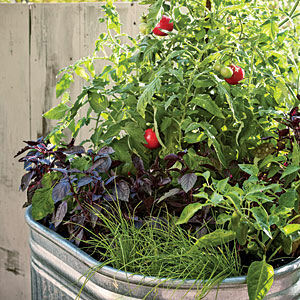 And while you’re growing edibles, you can also use those container gardens to decorate your outdoor areas as well. Use containers of veggies or herbs in groupings with your flowering plants, or plant a showy annual in the container with the edibles. Many vegetable plants especially have interesting foliage and blooms that can add color and texture to your container garden areas.Small trees or shrubs that produce berries or fruit work great as stand alone plantings, but you can also underplant them with mounding or trailing annuals for color. 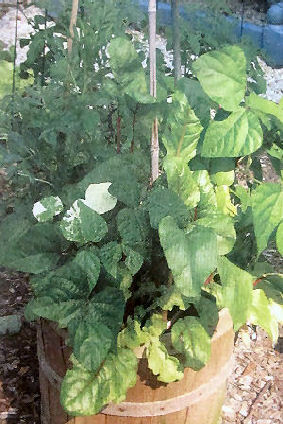 When growing edibles in containers, select compact varieties of vegetables that you can train on a trellis. Use that as a backdrop for your flowering plants – and for privacy too. Some gardeners like to separate their edible gardens from their flowering displays – do whatever works for you. Plant a corner of your patio or deck that is easy to access for watering and harvesting. Or, plant them away from your outdoor living area if you have the room – just make sure they have plenty of sun. Find the best container – what would you like to grow? 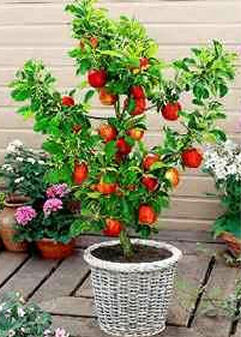 Growing vegetables in containers is most successful if you plant in the largest container possible for your area. Wooden boxes, half barrels or tubs are great. Pots can be as small as 12”, but 18” or bigger is better. The bigger the pot, the more soil it will hold and therefore, the more moisture it can retain as well. 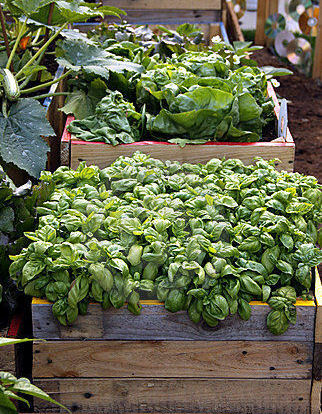 Boxes, like the crates above, are great for growing vegetables, especially for those with deeper root systems, or carrots, potatoes, etc which grow as tubers underground. Crates that were previously used for shipping bottles, cartons or fresh produce are good – watch for discarded ones at grocery stores or produce markets. Even if the crates have spaces between their slats, just line the crate with landscaping paper before you fill it with soil and plants – it will work just fine. Any material for your container is fine – thick plastic, glazed terra cotta, wood or ceramic – just remember that if you use unglazed terra cotta, especially for smaller containers, more watering will be required. Also, if you live in a really hot climate, avoid metal containers and dark colored ceramics or plastics. These materials will heat up too much and literally fry your plants and roots. 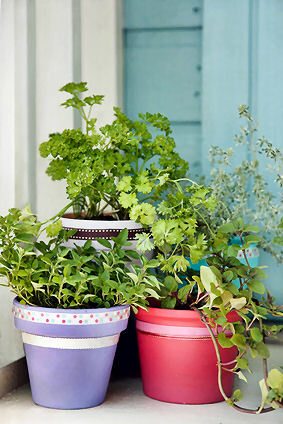 These colorful, ceramic containers look lovely in this grouping – edible plants can be attractive too. 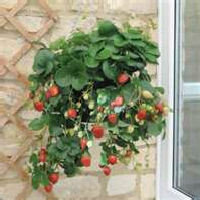 Even hanging baskets are good for growing vegetables without long roots. Tomatoes, strawberries, radishes, spinach, short varieties of carrots and “soft” lettuces like romaine can be successfully grown in hanging containers. 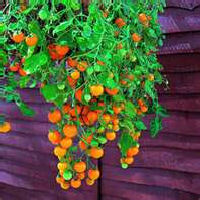 Vegetables grown in hanging baskets may need watering more often since they are exposed on all sides to sun and wind. Keep your baskets hung low enough to maintain them easily – and also to let you enjoy their colors and scents. Save your 4-gallon nursery containers and use them for growing edibles. One zucchini plant in a 4-gallon pot can produce 10 squashes. Ready to unleash your inner farmer? Want to know more about growing edibles in containers? Vegetable gardening and the easiest vegetables to grow in containers. Explore edible flowers – many of the plants you will use for decoration or show in your containers can add flavor to your recipes and garnishes to foods and drinks. Pansies and marigolds, both shown here, are edible flowers. Find out how to use their flowers in foods and as garnishes.